Regardless if you are looking to spend $20 or $1,000+, there are countless ways to organize your kitchen cabinets like a pro. From investing in frameless cabinets to adding pull out drawers, we are counting down the best kitchen organization tips and tools! 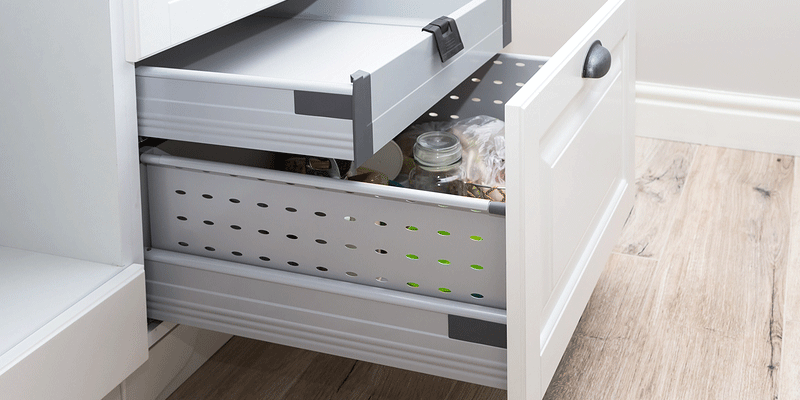 It’s not always easy to get up the motivation to clean out and reorganize your drawers, but it’s always time well spent and you’re sure to thank yourself later. So put on a fascinating documentary or have a podcast play on your smartphone while you get busy following these tips for more organized kitchen cabinets. You might want to work on a few cabinets at a time, as opposed to emptying all of your cabinets at the same time—that can get pretty messy! Once the contents of your cabinets are all over the floor and countertops it’s time to go through the mess and start figuring out what you do and don’t need. If it’s something you only use once a year, perhaps you can store it in the garage or a hallway closet with spare room. And those things you never use, perhaps it’s time to finally give them away. Once you’ve sorted through the good, the bad and the completely useless, you should be faced with everything you use on a somewhat regular basis. Now it’s time to start categorizing everything into groups. The goal is to put things back as a group so that your cabinets make sense. Put the things you use most in the easiest to access locations. You can store the things you use less frequently towards the back of cabinets or on bottom/top shelves that are harder to reach. This is where everything can start to get messy again if you’re not careful. If you simply put everything back as it was before, only this time in more organized groups, your cabinets may not look or function much differently. Especially a few weeks down the road. By investing in some helpful organizational tools you can keep your cabinets orderly over the long haul. You can pick up a lazy Susan for pretty cheap, and yet this simple tool makes organizing your kitchen cabinets so much easier. Even the stuff you put at the back of your cabinet automatically comes to the front with a simple spin. Add stackable metal or mesh shelves to cabinets in order to organize different things without stacking a bunch of different stuff on top of one another. This prevents the common issue of stacking small plates on top of bigger plates, and then having to move the small plates every time you want a big plate. The Container Store, Amazon, and a number of other retailors offer stackable shelves for affordable prices. Measuring cups, recipes and other odds and ends can be hung on the back of your cabinet doors to save space, de-clutter and help maintain better organization. By adding a corkboard to the back of your cabinet doorframe(s) you can easily secure items in place with pins. Invest in glass decanters and containers that you can label and use to store everything from powdered sugar and flour to cereal and chips. By streamlining containers your cabinets automatically have a more organized appearance. Plus, this helps eliminate clutter caused by random bags and boxes all tossed in together. You can purchase custom cabinet inserts or create your own DIY pull out racks. Either or will make it so much easier to store things like cutting boards and baking sheets. Add pull out drawers so that you can see exactly what’s inside of your cabinets and prevent losing things to the dark back corners. If pots and pans are taking up the majority of your cabinet space, you may want to consider adding a hanging pot rack in order to clear out more space. If you are planning to re-do your kitchen cabinets, we highly recommend investing in frameless cabinets. They offer the most bang for your buck in terms of storage space. Frameless cabinets do not have a face frame, which automatically means more space for storage and greater accessibility. At Tops Kitchen Cabinet and Granite we offer a wide selection of frameless and framed kitchen cabinets at wholesale prices your budget will love. We’re here to help you score a beautiful and well-organized kitchen for less!